Antique clocks and their origins; clockmakers and production periods. Your Guide to Collecting Antique Clocks from Longcase Clocks to Cuckoo Clocks. Antique Clocks hold a fascination for the mechanically minded, in both the intricacies and the superb engineering produced without the help of computerised production methods. Mans’ interest in antique clocks is growing and man has always recognized the passing of time and has tried to measure and record that passing. The simple alarm clock owes its existence to more than 6,000 years of thinking about time and tinkering with devices to accurately mark its passing. Farmers sectioned quadrants of time into broad periods of seasons for planting, growing and harvesting. In those days however, the actual hour of any particular day was not important. As early civilizations grew and became more complex in their needs for order and governance a more precise measure of time was required. The early Egyptians originated the division of each day into two measurable parts, using the position of an obelisks shadow to mark high noon. Other early and more precise timekeeping devices also include the hourglass, indexed candles that burned at a fixed rate, and water powered devices. In medieval times, the regulation of monastic calls to prayer was accomplished by means of mechanical tower clocks. This revolutionary device soon synchronized the rhythms of entire cities. World views of entire cultures were influenced by the type of clocks they used. The development of atomic clocks, accurate to a billionth of a second, seem to reflect modern society’s near-obsession with youth, age and the passage of time. The very first early mechanical clocks, which didn’t have pendulums, were developed in the last half of the thirteenth century. Probably by monks from central Europe, and were placed within the church. They did not have dials or hands and only struck bells on the hour. These mechanical devices were probably placed in the church belfry in order to make use of the existing church bell. It was over 100 years before visible dials and hands were added. These early clocks were very large and were made of heavy iron frames and gears forged by local blacksmiths. In 1580 the Astronomer Galileo observed a swinging lamp suspended by a long chain from a cathedral ceiling. He studied its swing and discovered that each swing was equal and had a natural rate of motion. He later found this rate of motion depended upon the length of the chain or pendulum. In 1640 Galileo designed a clock mechanism incorporating the swing of a pendulum, but he died before building his clock design. He found it kept excellent time. Regulating the speed of the movement was done by simply raising or lowering the pendulum bob. Up to speed-up the clock movement and down to slow-down the clock, thus the terms speed-up and slow-down. Huygens invention allowed clocks to be accurate to as little as three minutes loss or gain per day instead of the previous quarter to half an hour per day. The introduction of a minute hand came about because of this increased accuracy. By 1670, the introduction of the anchor escapement had decreased the time variance to as little as a few seconds per week. By the 1600’s, small domestic clocks started to appear. They were probably made by the local gunsmiths or locksmiths. After 1630, a weight-driven lantern clock became popular and was used at home by the very wealthy. When the swinging pendulum was added in 1656, clocks became even more accurate. Very early clock movements were mounted high above the floor because they required long pendulums and large cast-iron descending weights. In reality, they were nothing more than simple mechanical works with a face and hands. They were referred to as wags-on-the-wall. The long-case or grandfather clock actually evolved from these early wags-on-the-wall prototypes. Wooden cases were used only to hide the unsightly weights and cast-iron pendulum. Although the Dutchman Hyugens’ innovative pendulum design brought a great leap forward in clockmaking, it was English clockmakers who reigned supreme in Europe. From about 1660 until the 19th Century, America introduced inexpensive brass movements. Clocks were first brought to the American colonies in the early 1600s by wealthy colonists and owning a clock was a status symbol. Most ordinary people could not afford a clock of their own and had to rely on the church clock or the town clock. Privately owned clocks were only found in the finest of homes and were sure to be displayed in prominent positions for all to admire. Most early clockmakers were not skilled in woodwork techniques and turned to joiners for their woodworking abilities and the early jointers used the exact same jointing techniques and styles they used on furniture. It wasn’t until 1683 that an immigrant, William Davis, actually claimed to be a clockmaker. By 1799, the great number of clocks attracted horological artisans to the New World. Most of these early artisans settled in populous centers such as Boston and Philadelphia. Later, others came to New York, Charlestown, Baltimore, and New Haven. The handcrafting of clocks grew in all areas of the eastern part of the colonies. At the beginning of the eighteenth century, there were many makers of long-case clocks in the Quaker colony of Pennsylvania. The earliest clockmakers from Philadelphia were Samuel Bispam, Abel Cottey, and Peter Stretch. One of the most famous of Philadelphia clockmakers was David Rittenhouse. Rittenhouse succeeded Benjamin Franklin as president of the American Philosophical Society and later became Director of the United States Mint. After 1800, tall-case clocks were produced more cheaply and in quantities that made them both affordable and available to a greater number of people. The clockmaking industry spread to Massachusetts, Connecticut, New Hampshire, Rhode Island and Vermont. 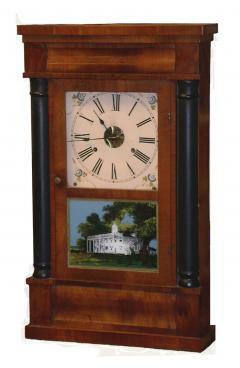 In Massachusetts, Benjamin and Ephram Willard became very famous for their exceptionally beautiful long-case clocks. In Connecticut, the first successful, domestic, mass-produced long-case clocks were developed by Eli Terry. In those days, most clock cases were made by local cabinetmakers. The works, either brass or wood, were made by a firm that specialized in clock works. The cabinetmaker engraved or painted his name on the dial, claiming credit for the completed clock. Most people refer to tall clocks as grandfather clocks but interestingly this term didn’t come into popular use until the late 19th century. Tall clocks were previously called either standing clocks, tall-case clocks or hall clocks. 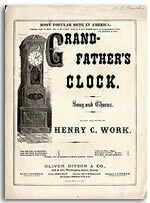 In 1876, a man named Henry Work wrote a song called Grandfathers Clock. It became the most popular song in America and the sheet music cover shown here was probably published in 1879, three years after the introduction of the song. The song’s tremendous popularity lasted well into the 20th century. The advent of the Industrial Revolution, together with standard working hours and the introduction of train schedules, brought about the need for standardised timekeeping and this really brought clockmaking to the fore. After 1840, wooden movements were abandoned and the 30-hour brass movement became popular, mainly because of its low price. Soon after, the spring-powered movement came into being and this really paved the way for a variety of new and smaller clock cases. Before 1840, manufacturers were mostly individual clockmakers or family-owned companies. In 1840 however, Chauncey Jerome built the largest clock factory and started shipping clocks all over the world. It is said that the Jerome Clock Company motivated the organisation of the Ansonia Clock Company and the Waterbury Clock Company. These three companies, along with the Seth Thomas Company, EN Welch Company, Ingraham Clock Company, and Gilbert Clock Company became the major clock producers. By 1851, there were over 30 clock factories in the USA and from 1840 up to 1890, millions of clocks were produced, of which many surviving examples can still be found. During the stock market crash of 1929, many of the large clockmaking companies failed or were re-organized. The great Ansonia Clock Company sold its assets to the Russian government, shipping its machinery and equipment overseas. The Seth Thomas Clock Company became a part of General Time Instrument Company. Of the original giants of the clock industry only three exist today. They are all currently divisions of larger companies. Seth Thomas is now a division of Talley Industries. The Ingraham Clock Company is now a division of McGraw-Edison and the Gilbert Clock Company has been replaced by the Sparta Corporation. No spring-powered clocks are currently being mass-produced in the USA. Period Antique Clocks … are highly sought after both for their aesthetic value and their investment value. Find examples you like and buy the very best you can afford to make sure your investment matures.